Among the many changes that IT Administrators face when moving to Office 365, deployment of the Office suite tends to raise the most questions. Is Office 365 Pro Plus the same as Office Pro Plus? What is Click-to-Run? Do my users need to download Office from the Office 365 portal? Do I still have control over the deployment of Office? In this blog, I will walk through deploying the Click-to-Run version of Microsoft Office 365 Pro Plus with System Center Configuration Manager (SCCM). Office 365 Pro Plus licensing gives you the rights to the latest version of Office Pro Plus. So, if you own a licensing plan that includes Office 365 Pro Plus, the version that you would be deploying today is Office Pro Plus 2016. Click-to-Run for Office 365 products is based on core virtualization and streaming Microsoft Application Virtualization (App-V) technologies. Click-to-Run resources run in an isolated virtual environment on the local operating system. Isolation of resources in a virtual environment allows for coexistence with earlier versions of Office, and improves the cleanup and restore processes. Extension points to the computer are published so Office is more integrated. This allows for local add-ins to be integrated with the virtual environment. To package Office 365 Pro Plus, we’ll need to use Microsoft’s Office Deployment Tool. This tool will allow us to download the source files for our SCCM package and reference a configuration file during the installation. Start by downloading the Office Deployment Tool from the following this location. Run the downloaded “officedeploymenttool.exe” file. Accept the License Terms, click ‘continue’ and choose the location to extract the tool. I chose “C:\Office”. I will refer to this folder often in these steps. You can find more details and configuration options for the Office Deployment Tool here. This will download the 32-bit source files to “C:\Office”. NOTE: Make sure you have all the files in the selected folder before running the command or you may see an error during installation. I have seen some issues with the “stream.x86.x-none.dat” file failing to download and had to run it again. The last step in our packaging process is to edit the “configuration.xml” file one more time. Remove the source location from the “configuration.xml” file. This will force the tool to use the cache folder rather than preloading the files to “C:\Office”. 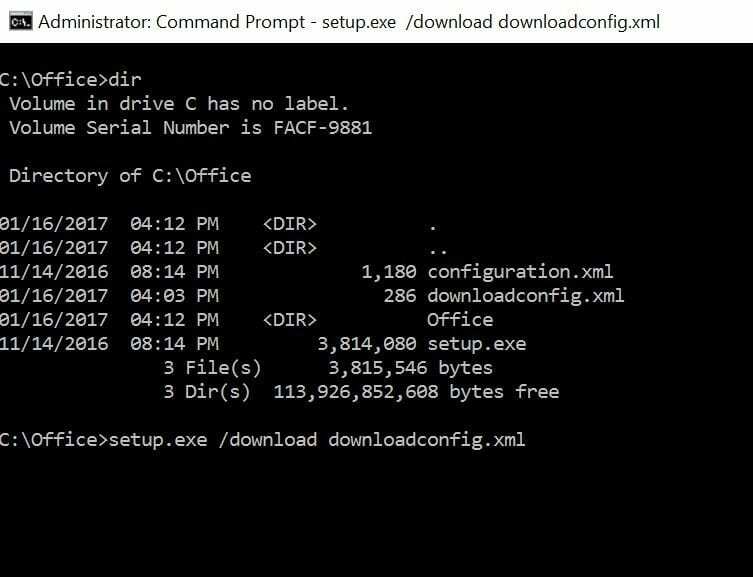 Copy the “C:\Office” folder to your software source share. NOTE: Keep the root package file with the setup and configuration file and the Office folder containing the source files. Now that our software package is created and stored in a central location, we need to create the application in Configuration Manager. On the General page of the Create Application Wizard, select Manually specify the application information, and then choose Next. On the General information page, enter a name for the application, enter any optional information, and then choose Next. On the Application Catalog page, provide the information that’s appropriate for your environment, and then choose Next. On the Deployment Types page, choose Next (you will add a deployment type later). On the Summary page, review the settings you’ve chosen, and then choose Next to create the application. After the application is created, on the Completion page, choose Close. After creating the application in SCCM, you’ll need to create a deployment type to determine how the application will be installed. Select the Office 365 Pro Plus application, and then on the Home tab, in the Application group, choose Create Deployment Type. On the General page of the Create Deployment Type Wizard, in the Type list, select Script Installer, and then choose Next. On the General Information page, enter a name for the deployment type, enter any optional information, and then choose Next. In the Content location box, enter the network share where you put the Office Deployment Tool, your “configuration.xml” file, and the Office 365 Pro Plus installation files that you downloaded from the Internet. After you enter this information, choose Next. On the Detection Method page, choose Add Clause. In the Setting Type list, select Registry. In the Hive list, select HKEY_LOCAL_MACHINE. After you enter this information, choose OK, and then on the Detection Method page, choose Next. On the User Experience page, in the Installation behavior list, select Install for system, and then choose Next. If you want to specify any requirements or dependencies for the deployment type, choose Next to go through those pages in the wizard. Otherwise, choose Summary. On the Summary page, review the settings you’ve chosen, choose Next, and then choose Close. Once this is done you can update your Distribution points and you are all set to create a deployment for the new Office 2016 Pro Plus Click-To-Run package. More information on that here. Moving to the cloud represents a big change for many IT departments. Developing the skills to adapt to cloud infrastructure can take time, but hopefully this blog post can help to clarify the change. Have further questions? Need help implementing these changes or others? Give us a call at 630.832.0075 or email us at info@peters.com. Check out other Technical Blogs.